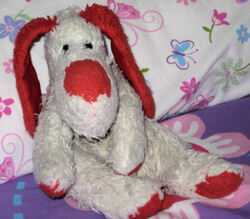 My dauther Bridgette has had this stuffed animal since she was born , twelve years ago. She lost it at a hotel in the spring of 08. I called everyday looking for him and offered a reward. The puppy was never found. She still cries about puppy and how much she misses him. I just can not remember the name brand. I thought it was a Gund , but was told it is not. Found it, I’m pretty sure it is a Ty Adonis dog. Do you remember an approximate size? The Ty would also be close but age wise isn’t old enough if she got it approximately 1996. Not sure this possibility is old enough either.